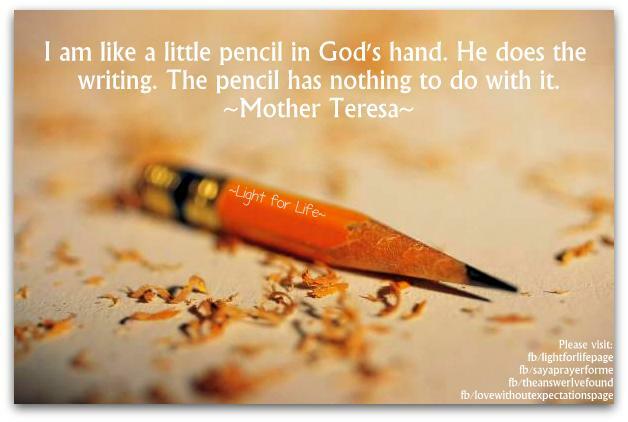 “I am like a little pencil in God’s hand. He does the writing. The insight and inspiration that I receive from every lesson fills the posts you will read here. Everything we learn has value for our life and for the people in our families and communities. Nothing needs to be wasted if we learn our lessons and keep growing… then nothing is lost! My motto is… I learn therefore I write… and that’s just how it is. A fine website. By any chance is there a Canadian office or will there be a seminar in Canada? just THANK YOU.. you are using your gifts that our Holy Spirit & Lord has given you & I just wanted to say … Thank YOU.. God Bless..
and yes, I have shared! Oh TresaLynn hi!!! Thanks for saying hi and you are just so encouraging to me. Thanks so much for sharing too =) What a blessing you are! Hi Barbara! Thank you so much for taking the time! I am sorry I didnt see your comment earlier. Thanks for writing! Sorry I didnt see this sooner!